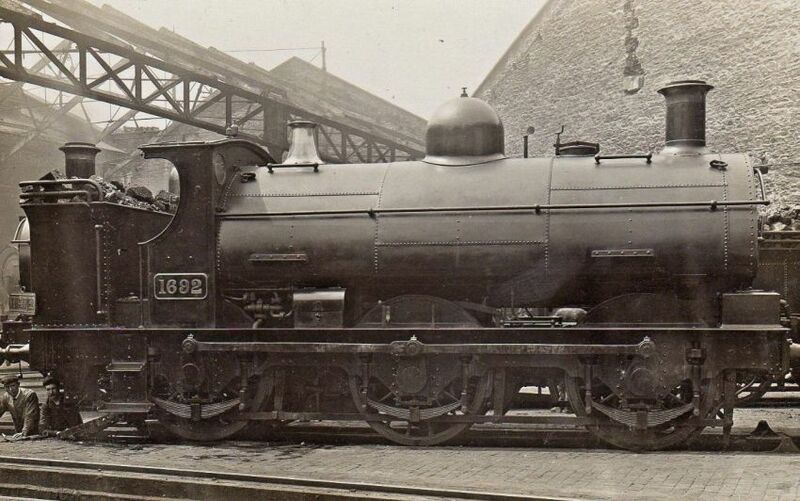 8791, ex-works at Swindon, in 1934. Despite the 'official' livery of the time, the safety valve cover is unpainted brass. 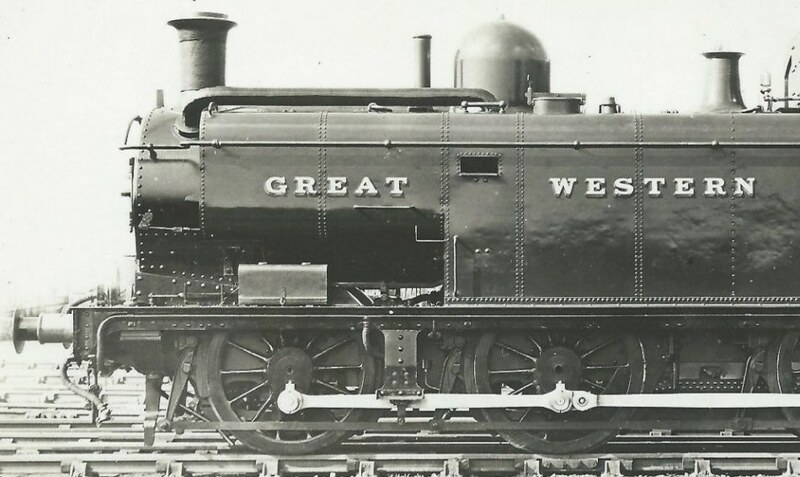 It is one of the last pannier tanks to receive 'GREAT WESTERN' insignia. 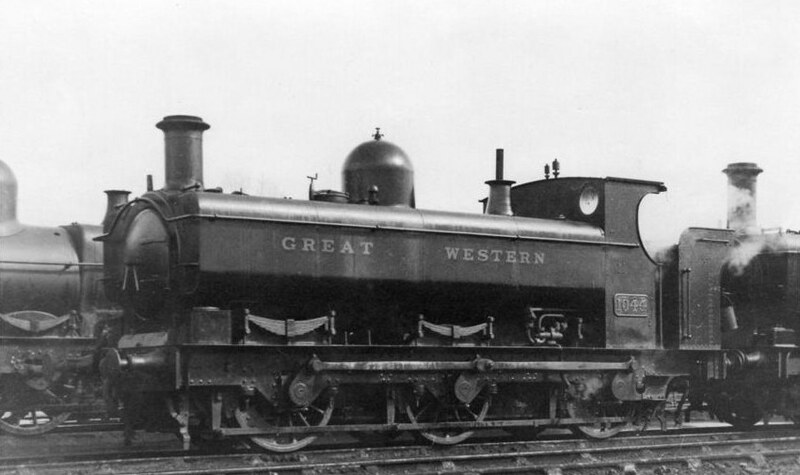 When the GWR started to put Belpaire fireboxes on their 0-6-0 tank locomotives it seems that the saddle tanks they'd used up to that time were just too complicated to fabricate 1. 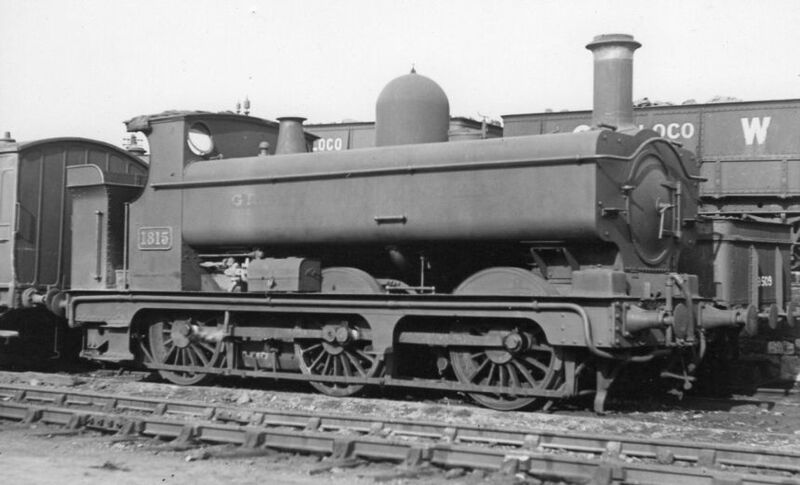 Equally it seems they did not favour side tanks, which had only been used on two classes of 0-6-0, one of which was already being converted to saddle tanks. The concept was first seen on a rather strange 4-4-0 tank, number 1490 2, but the story of what were to become the Pannier tank classes starts much earlier. 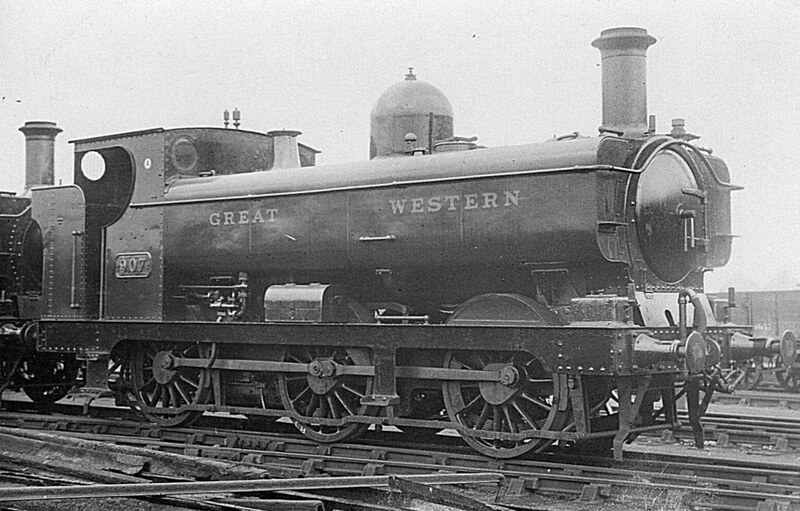 In the earlier days of the GWR, Swindon built Broad gauge and Wolverhampton narrow (=standard) gauge locomotives. As the broad gauge faded, Swindon took on standard gauge as well – and indeed came to be dominated by Wolverhampton trained staff 3 but the two factories were very independent with their own design teams and practices. There were many classes and types of pannier tanks, including various absorbed engines and small classes for special purposes. However, the predominant batches can be roughly divided into two main groups, large and small, and in both a line of development can be seen. In Victorian days there was a plethora of different classes, and for the purposes of this article much detail will be simplified and even omitted. Variations in boiler pressure, topfeed or superheating, number of tubes or dome position (or absence), size and shape of saddle tanks, shape of bunker and the like are beyond the scope of this document 4. The pre-grouping classes appear to exist in quite mind-numbing complexity and variety. A lot of the reason for this is based around maintenance practices. 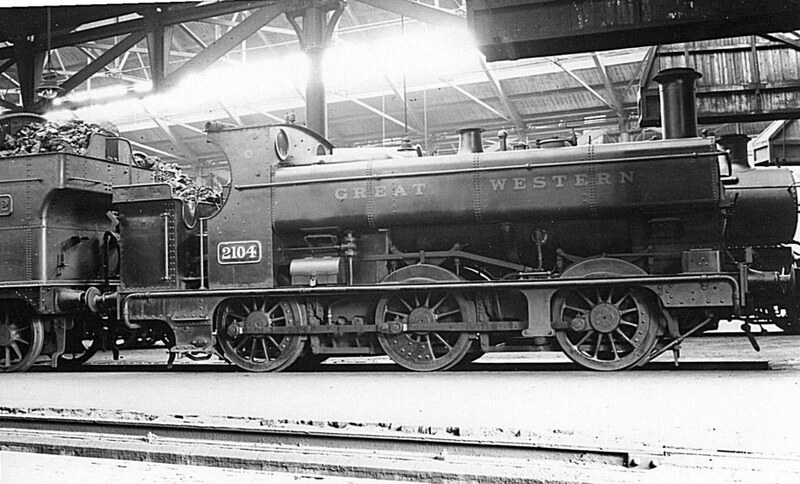 When a major overhaul was due the GWR would dismantle a locomotive virtually down to its component parts 5. The boiler in particular would take longer to repair than the rest of the locomotive, so by the beginning of the 20th century an alternative boiler (and matching water tanks) would be fitted as soon as the rest of the locomotive was ready in order to bring the locomotive back into service. Because of the interchangeability of boilers, this boiler might well not be the same design (or even class) as the one that came off. Thus a locomotive might be rebuilt with pannier tanks at one major overhaul, yet revert to saddle tanks at the next one, depending on what was available. Over the years the earlier boiler classes went out of use (no new Standard Goods Sir Daniel or Metro boilers were built after the 1920s for instance) and so the amount of variation tended to reduce. Wolverhampton tended to go very much its own way in the 19th century, and a locomotive rebuilt at Wolverhampton would be appreciably different to one rebuilt at Swindon. In minor details like bunker shape this practice persisted as late as the 1920s. The RCTS volume on GWR 6-coupled tank engines lists well over 150 variations in boilers used on the classes mentioned in this piece. However, for our purposes we can list nine basic "classes" 6 of boiler used on them. Boilers seem to have been the subject of continuous development, especially during the Churchward era. It's a mistake to think that a P type constructed in 1880, pressed to 140psi with a round top firebox and 268 1½" tubes, had much in common with the last of the type, pressed to 200psi with Belpaire firebox, 219 1&frac58;" and two 5½" tubes, which were still being built as late as 1950. O Std Goods 11' 4'5" 5'4"
P 2301 10'3" 4'5" 5'4"
Q Sir Daniel 11' 4'3" 5'4"
T Metro 10'6" 4'3" 5'1"
Auto gear for push-pull operation seems to have started being fitted as early as 1906, but became more widely fitted as the Steam Rail Motors started to go out of service. Available records suggest locomotives fitted with autogear at one major overhaul might have it removed at a subsequent one. I suspect that when an autofitted locomotive came into the shops then the gear might be removed and fitted on one just about to leave in order to maintain the desired number of autofitted locomotives in service. Of the smaller classes, the 2021 was most often autofitted, and 655 and 1076/1134 amongst the large wheel classes, but odd ones and twos of 1901, 1501 and 1016 classes received the gear from time to time. Thus there was a mixture of small and large classes fitted, although the large ones selected were among the less powerful types. As noted below the "small" 5400 and 6400 Collett classes would have been equally capable as the "large" 655 and 1134, and no 5700 or 9400s ever seem to have received the gear. When more powerful autofitted engines were required in BR days the equipment was fitted to some 4500 class small prairie 2-6-2 locomotives. 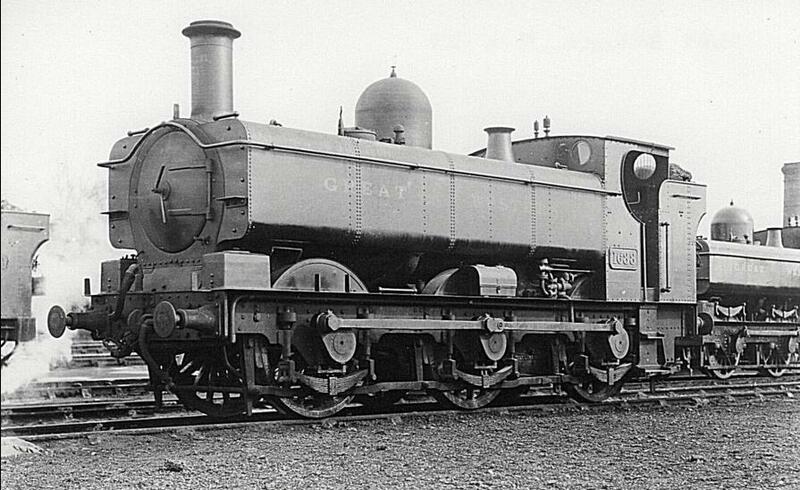 It's easy to think that, because few 0-6-0 tanks were nominally built under his charge, Churchward had no interest in the type. However, the RCTS volumes detail an immense amount of work on subtle and less subtle boiler changes, topfeed, superheating and so on. The conversions to pannier tanks started before 1914, but were very much as and when, with a very few retaining saddle tanks even after 1948. Many but not all were given enclosed cabs. Pannier tanks were designed to fit the boilers used, which varied over time as well, so it seems that quite a selection of different sized tanks, boilers and cabs could be seen at various times on locomotives that had started life in the same batch. It must have made life interesting for trainspotters, and makes life equally interesting and research essential for the discerning modeller. Through Churchward's time, and going on into Collett's, the earlier large tanks tended to receive larger boilers, mainly Q and then P units. 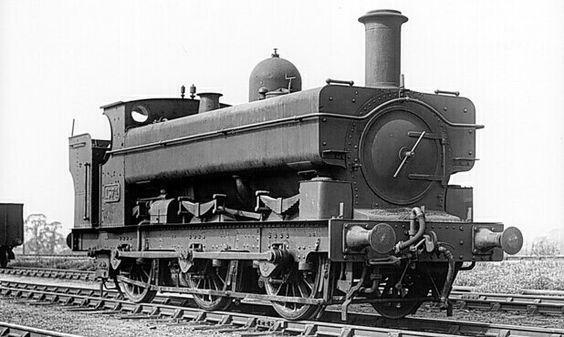 An engine that had started out as the same class would have looked quite different with the longer and thinner Q class boiler than it would with the stumpier P class. Some of the earlier locomotives had very considerable increases in weight over the years – the early 302 class for instance, 35tons 13½cwt when built, weighed 43tons 2cwt in their final condition with P class boilers and other changes 8. The large tanks started with outside-framed saddle tank engines, all with the barest minimum of weather protection for the crew – just a spectacle plate and waist level cab sides. 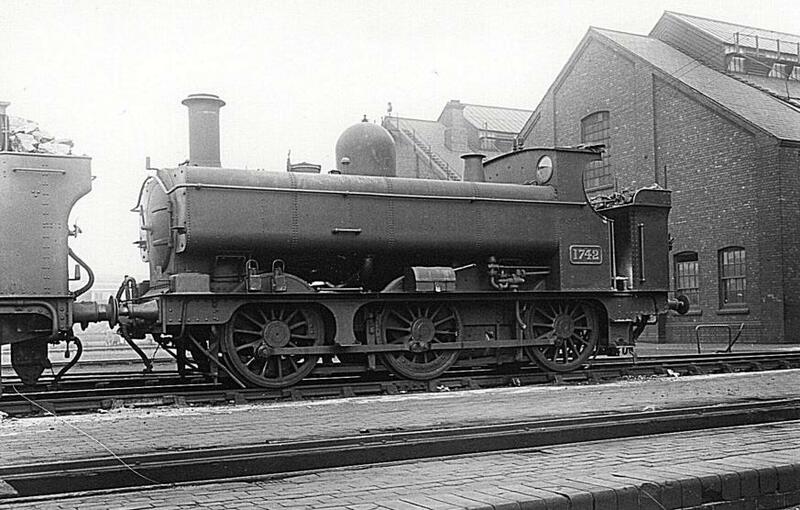 The progenitors started at Wolverhampton with the 302 class (1864/5) of eight engines, and its close successor the 1016 class (1867–71). These had wheel spacing of 7'4" (leading) and 8'2", and wheels that started at 4'6" but were later fitted with thicker tyres to 4'7½". The 302s had 4'6" front overhang and 5'2" rear overhang, and the 60 1016s were somewhat longer: 5'3½" front and 5'11" rear. 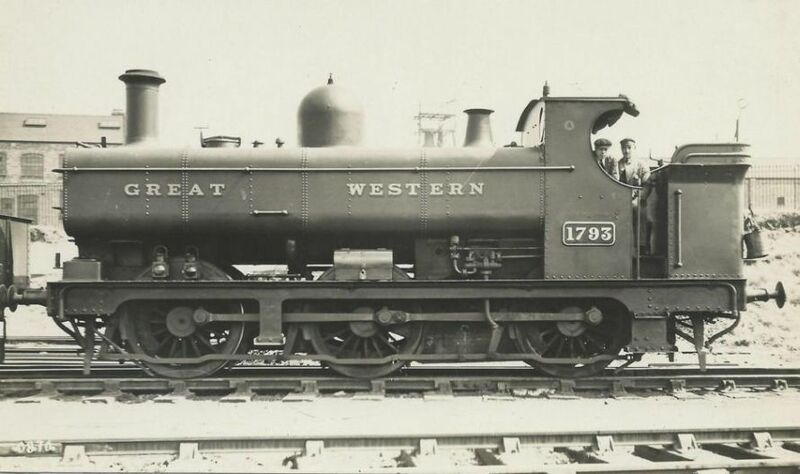 Between 1878 and 1885 Wolverhampton also produced various conversions from tender engines including the 119 class of 11 and the 322 (with 5'2" wheels) class of six. Some were converted back to tender engines, but the others survived to gain pannier tanks in the fullness of time. 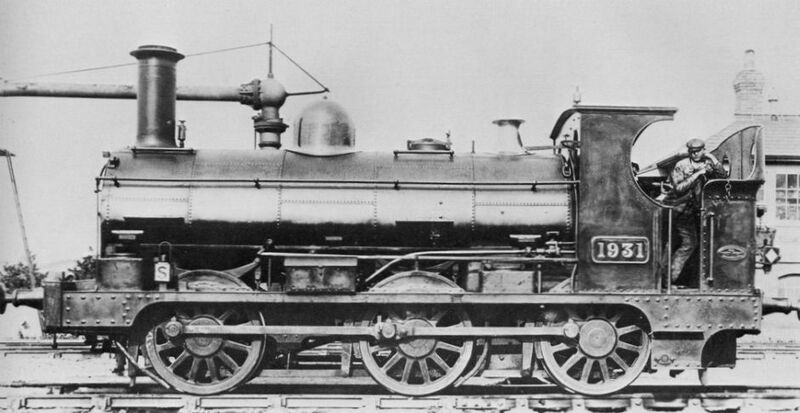 The original boilers were similar to but smaller in diameter than the Q class. 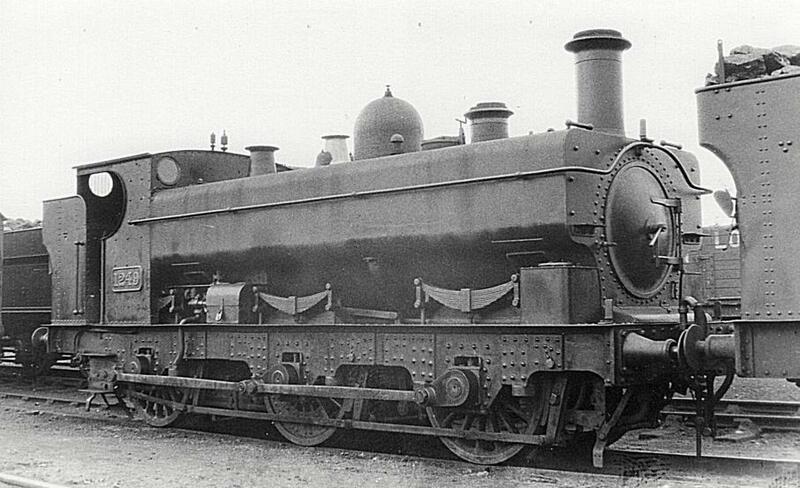 They first received Belpaire Q class boilers from 1911 and then P class from 1922. Pannier tanks appeared with the Belpaire fireboxes. 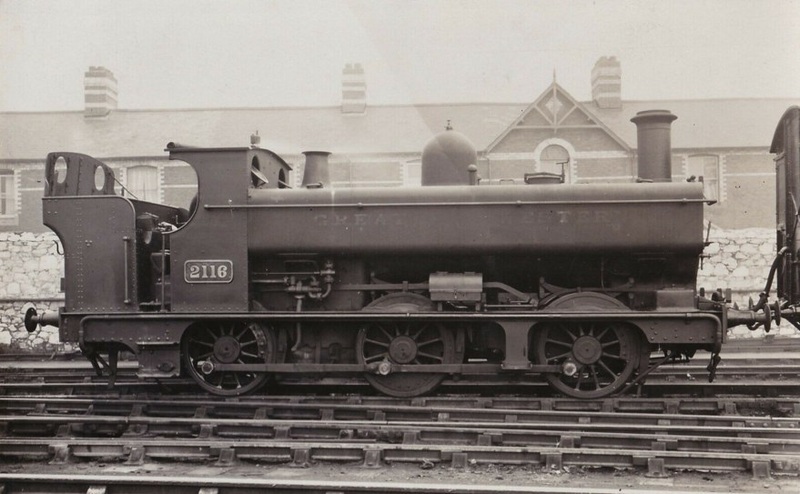 All but 11 of the 1016 were eventually fitted with pannier tanks. Some of the later survivors received larger bunkers and enclosed cabs. They were mostly scrapped in the 1920s and early 1930s, with the last survivor (1047) going in summer 1935. 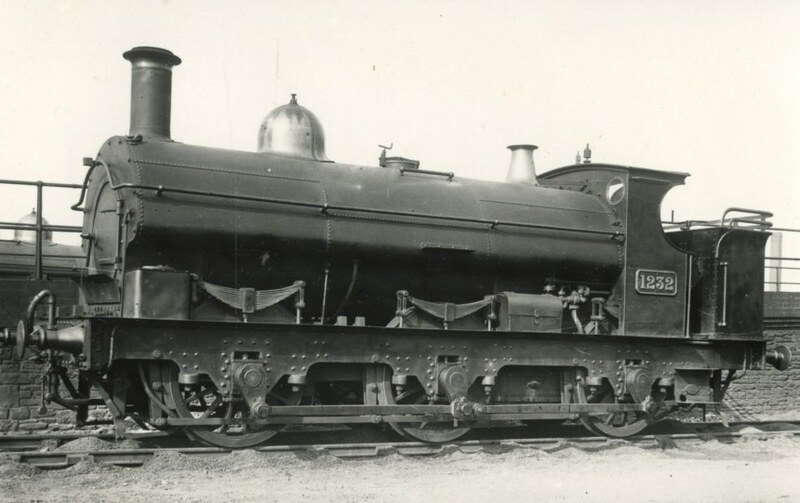 1051 in near-original condition with a short saddle tank of five unequal segments. Note how slender the rods are. 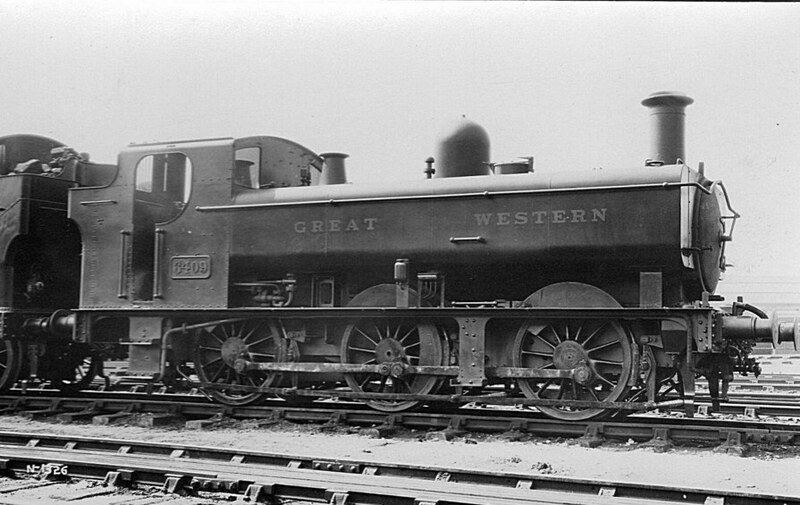 307, one of the small number (eight) of the 302 class, receiving attention at Swindon on 11 September 1927. It was allocated to Didcot at the time, and fitted with a spark-arrester ('busby') for working the Didcot Ordinance Depot. 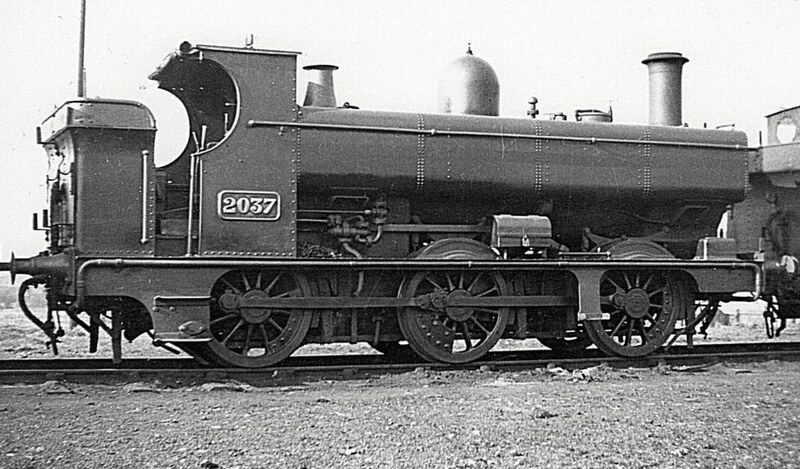 The 302 class were apparently built with slotted frames, but most of the class seem to have acquired more conventional style frames at a later stage. 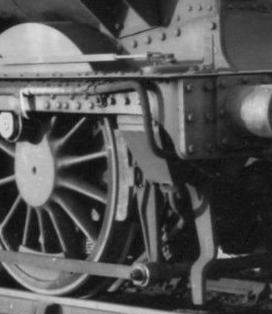 The inner frame springs of the middle axle are mounted above the axle, and this unusual feature can also be seen in the 1054 picture below. 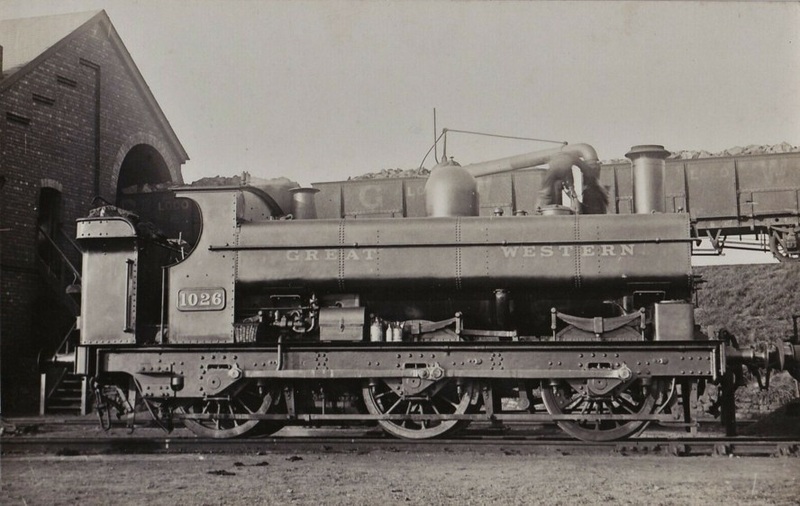 1026, one of the first batch of the 1016 class, with a Q class boiler and small tanks. Date unknown, probably early 1920s. Towards the end of its life, open-cabbed 1054 retains its Churchward bunker. 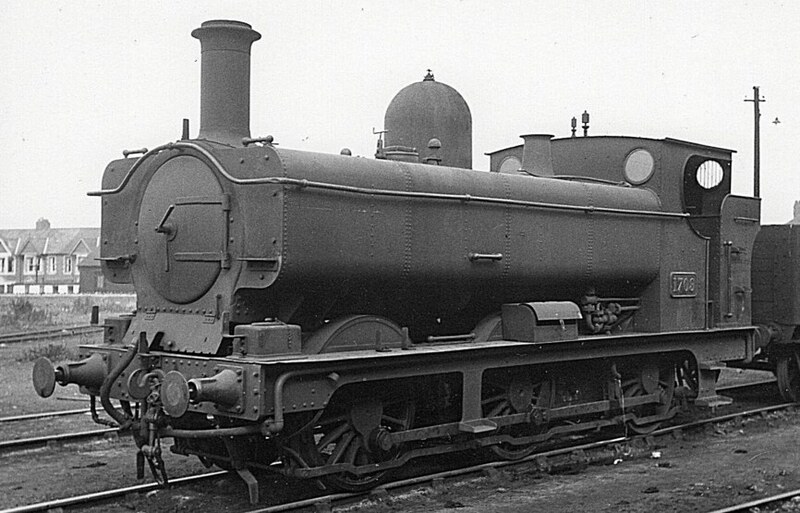 This has a P class boiler and large tanks. A small handrail to assist accessing the filler has not been fitted, despite the large tanks. Swindon chimed in with the 1076 class in 1870. 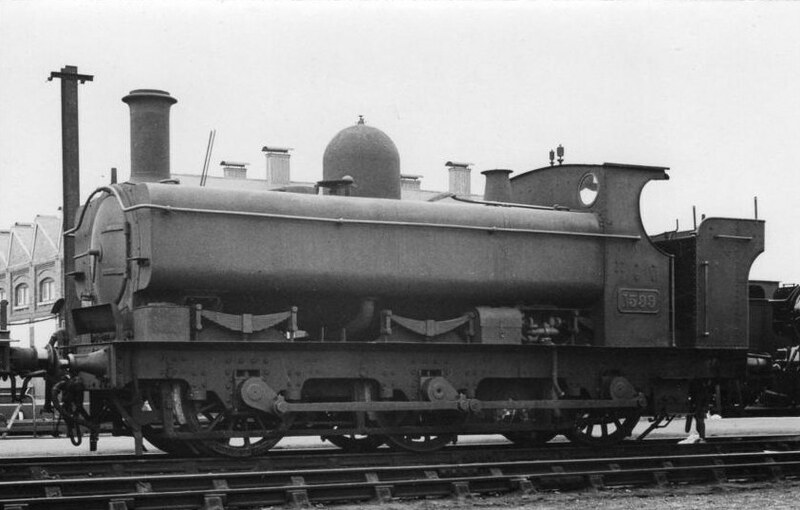 The first six had side tanks, 4'9" front overhang and 5'2" rear overhang, and had boilers similar to but smaller in diameter than Q class. They were followed by the 50 of the 727 class of 1872/3, substantially similar but with short saddle tanks and 6' rear overhang. 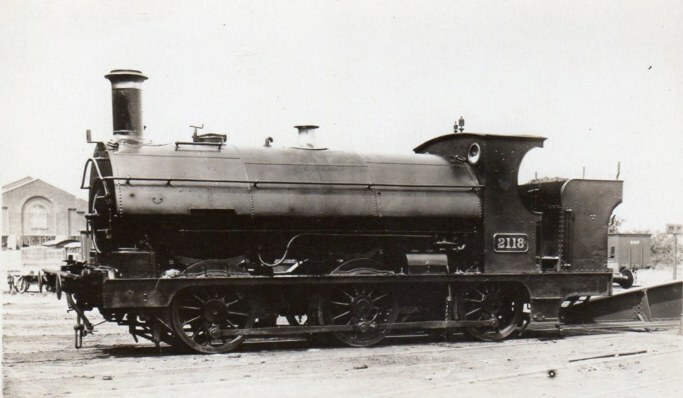 Next were the 1134 or 'Buffalo' class, 210 in all, with 6'9" rear overhangs. Some of the Buffalo class ran on the Broad gauge for a while, which necessitated the wheels being outside the now inside frames. By 1878 they were being turned out with open cabs and short cab roofs. Middle batches had O or Q class boilers and some of the last batches a shorter boiler, which was closer to the P class. These three classes tended to merge over the years, and are often treated as one. With a total class membership of 266, it is perhaps not surprising there was so much variation over their lifetime. Buffalo 1572 with a five-segment saddle tank, tall chimney and open coal rails on the bunker. The cab and bunker are lined, but the tanks are not. Probably between 1900–5. It was fitted with pannier tanks in 1914. Buffalo saddle tank 1232, with a later standard three-segment tank but a dome on the front ring. Pictured probably pre-WWI. It would receive pannier tanks in 1923. The water-balancing pipe on saddle tanks was a lot smaller compared to the larger size fitted under pannier tanks. 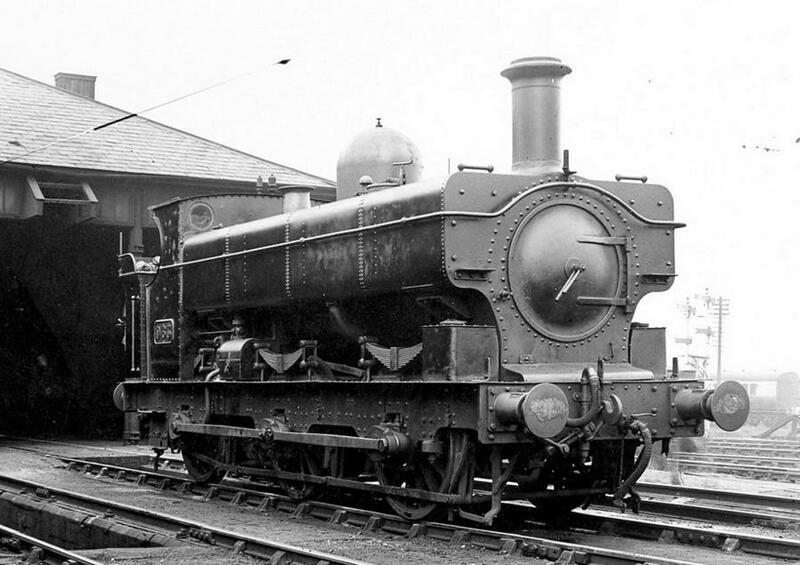 Buffalo saddle tank 1581, with the later standard three-segment tank and a medium-height chimney, at Worcester in April 1923. 1581 was one of the few Buffalos never to be fitted with pannier tanks, and lasted until 1929. Locos of this class tended to receive Q class boilers from the end of the 19th century, and Belpaire fireboxes and pannier tanks from 1911. About half the class received enclosed cabs with larger bunkers in the 1920s and many of the rest just the enlarged bunkers. 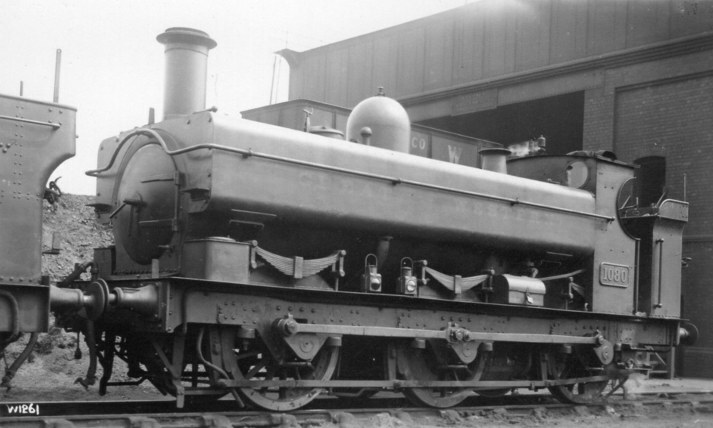 A few received the slightly larger O class boiler in 1920 and some of the later survivors received P class from 1930. They were mostly withdrawn between 1928 and 1939, but a handful survived the war. 1287, in use as a stationary boiler, made it to 1953. The four sketches adjacent illustrate some of the changes and variations made to the 1076 class. 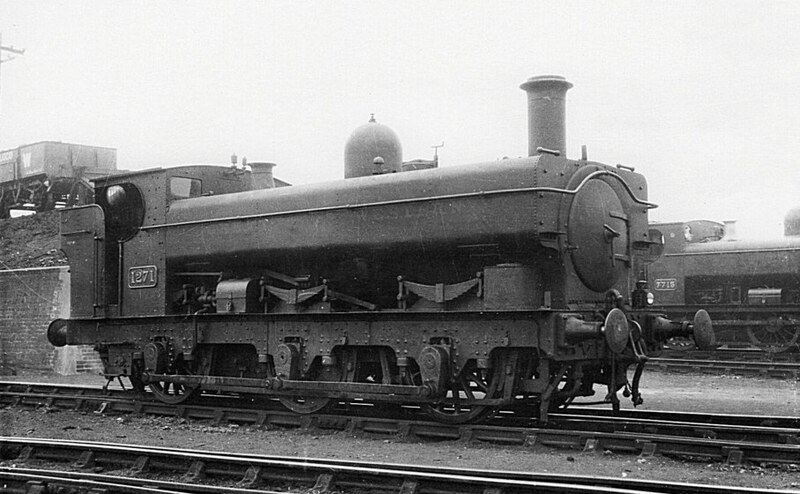 Buffalo tank, number unknown, but typical of a Q class boiler open-cab engine with a late form of Collett bunker. This particular engine has picked up a wider than usual front buffer beam. Not long before its withdrawal in 1925, 1249's frames have acquired a bunch of strengthening patches. 751, fitted with pannier tanks since 1915, gets a new lease of life in 1929 with an enclosed cab and new bunker, but would be withdrawn a couple of years later. 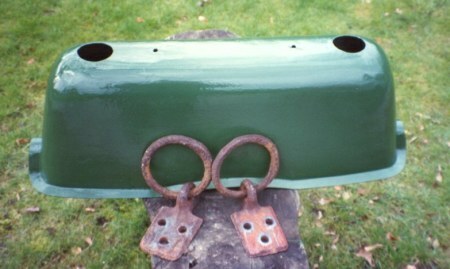 Some Buffalo tanks were fitted with screw-reverse and were autofitted, primarily for work in the Plymouth area. The locos involved included: 738, 1167/8, 1234/5/52/65/9/71/84, 1567/70/1600. 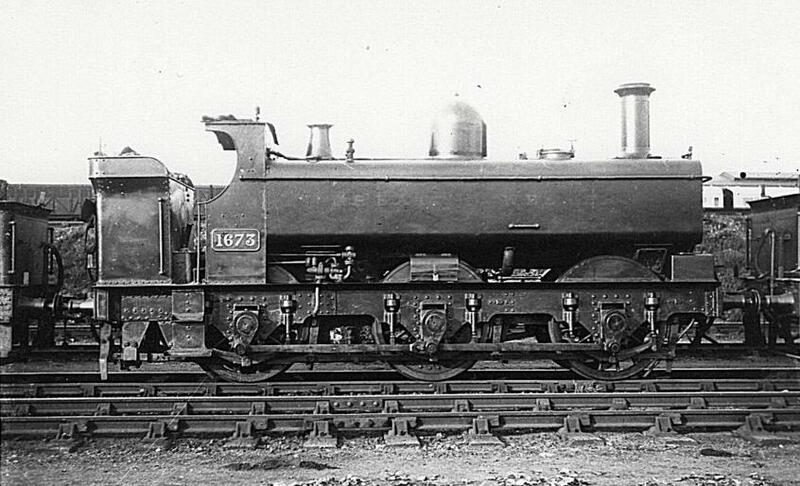 These locos had enclosed cabs with characteristic rectangular windows in their fronts, and most of them received extended tanks and smokeboxes, as shown on 1271, at a later stage (usually c 1930). ATC was fitted c 1930–1. The extended smokeboxes could feature either Collett fronts and smokebox doors, or retain the original Churchward features. 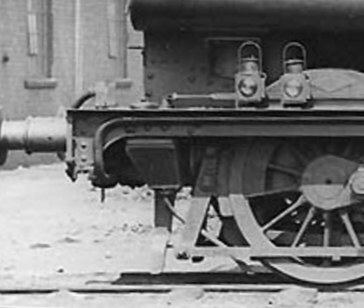 The locos were fitted with larger-diameter (16") Collett buffer heads, reflecting the increasing adoption of that size for many locos working with long autotrailers from the mid-1920s onwards. The larger 16" heads were bolt-ons to the Dean buffer heads. 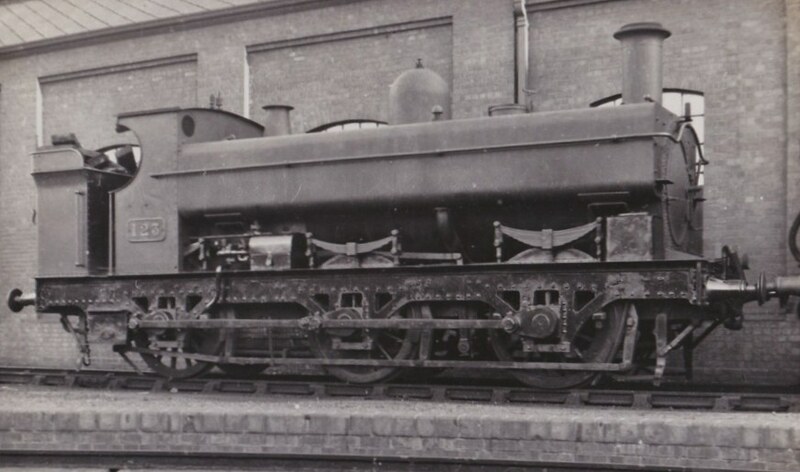 Like other other autofitted locos of the era, there is a packing piece between the buffer stock and the headstock, which increased the buffer length by approx 1.5". The autofitted Buffalos disappeared in 1937, being superseded by members of the 64xx class. Autofitted Buffalo 1235 near Laira on 1 May 1925. The loco still has its original length tanks at this time. 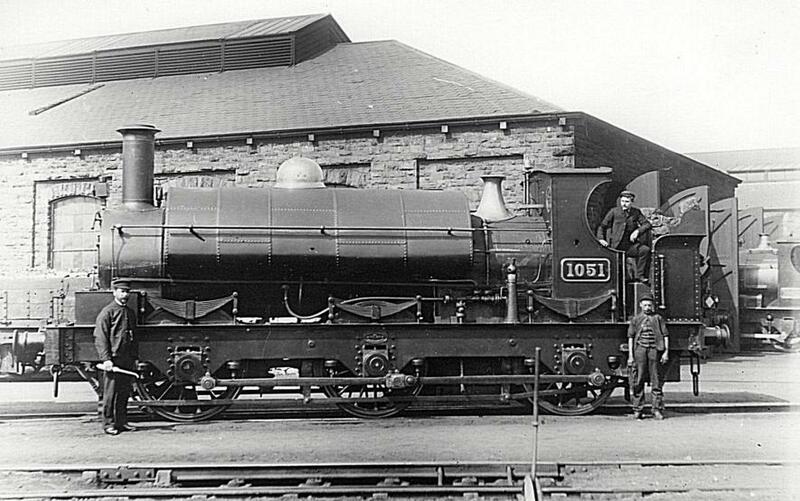 With substantially original features and a Q class boiler, this is perhaps the classic Buffalo pannier look: 963 at Pontypool Road shed in 1935. It was withdrawn the following year. Unusually for a Buffalo, the loco has acquired a set of Collett parallel-stock buffers. A dozen Buffalos were fitted with P class boilers and large (1200g) tanks between 1925 and 1930. These can be distinguished from the Q class boilered locos by their boiler tops being proud of the tank tops, the Q class boiler locos being 'flat-tops'. Some of these locos had enclosed cabs, some did not. It seems these locos were significantly wider (tanks, cab, bunker), at 8', compared to the 7'5" body width of other Buffalos. They were the largest and heaviest Buffalos. 1599 is in its last days, at Swindon, 28 June 1936. 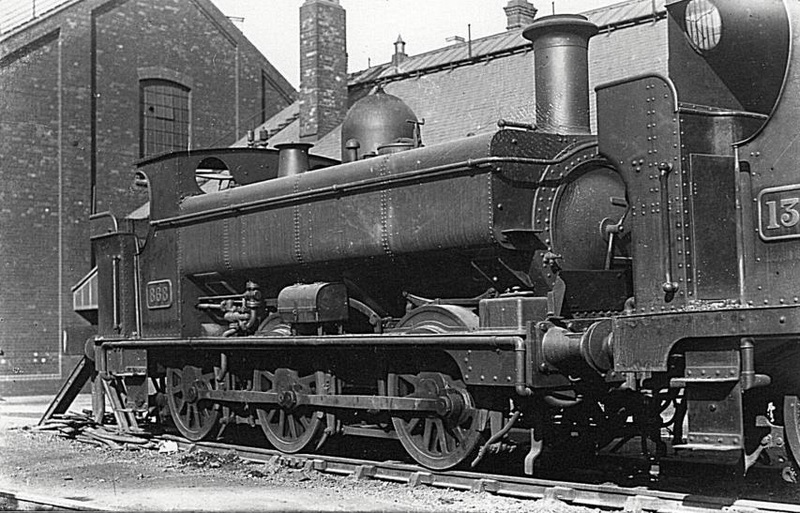 A variation was the 1661 class "production line" conversions of 40 2361 class 0-6-0 tender engines in 1886. 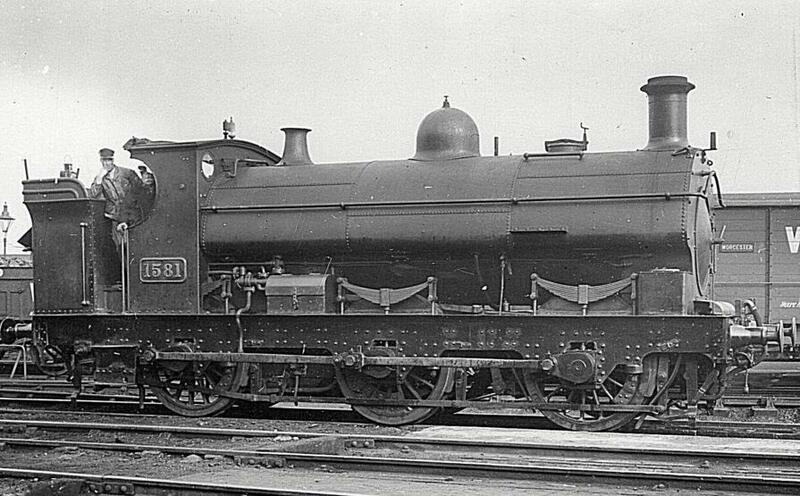 The 1661s were the tank engine version of the 2361 class, and had the 7'9" + 8'0" wheelbase and 5'2" wheels of the 2361 class. They had open cabs, and boilers similar to the P class, and can be readily distinguished by their underslung springs and the hangars below the footplate on the outside of the frames. They were fitted with large capacity tanks. These locos do not seem to have been greatly liked, and several were sold off to Welsh lines, only to return at the grouping. Belpaire boilers started appearing around 1901, and pannier tanks about 1914. About half got enclosed cabs and/or enlarged fireboxes. They were scrapped early, mostly in the late 1920s, the last going in 1934. These locos were the largest and heaviest of the outside-framed panniers, and spent most of their lives hauling heavy coal trains. 1692 in substantially original condition, with a three (and a bit) segment saddle tank. The cab and bunker are lined. There are two steps and two upper handrails on each side. 1673, above, with open cab, Churchward bunker, and flush-riveted tanks, and below, 1688 at Oxford on 9 April 1927 with snaphead-riveted tanks, enclosed cab, Collett bunker and Collett smokebox. 1688 and 1693 (below) have increased diameter cranks. Nearing the end of its life, 1693 at an unknown location. It has a topfeed boiler. 1693 and 1688 above have not received small handrails on the tanks to assist accessing the filler. This small class of eleven locos had a complicated history, some originating as tender engines in 1861 to a Daniel Gooch design. They were later converted to saddle tanks, some with condensing gear, at Wolverhampton during the Armstrong era, and were finally fitted with pannier tanks from 1913, usually fitted at Swindon. Most had been withdrawn by 1928, the last one (120) surviving until 1933. Inside frames started with the Wolverhampton 4'6" wheeled 633 side tank class, which never acquired saddle or pannier tanks so are not strictly part of our tale. Some of these were fitted with condensing apparatus for use on the Metropolitan & District underground lines in London, and curiously these were never fitted with cabs. 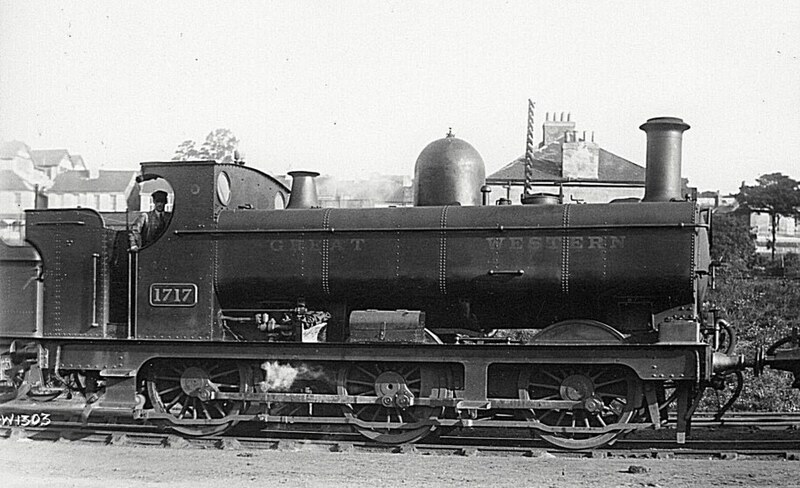 The 645 Class of 1872, again 7'3" + 8'3" wheelbase with 4'7½" wheels came next, followed by the 1501 subclass from 1878. A significant variation between these subclasses was bunker size. Early 645s had a 5'3" rear overhang, short saddle tanks and a small bunker, increasing to 5'9" with the 1501 series. All these had 4'8" front overhang. The 645 were built without cabs, and received a basic cab at the end of the 19th century. They had T class boilers. There were 32 645 (plus a few sold to other companies) and 72 1501s, which had more conventional saddle tanks and open cabs from new. 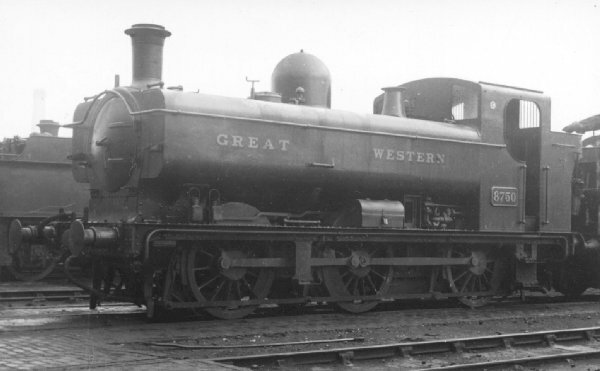 The 52 members of the 655 class, last of the large Wolverhampton engines, followed from 1892, and were larger again with a 5' front overhang and 6' rear. Again they were built with T class boilers. Some 645/1501 received lengthened frames and bunkers, tending to merge them with the 655 class. P Class boilers appeared from 1902, some with saddle tanks. Pannier tanks were introduced from about 1913. Around 15 received enclosed cabs. Most were scrapped in the 1930s, but a few survived the war and even into the first year or two of British Railways. 655s tended to receive P class Belpaire boilers and pannier tanks a little later than the 645s. Some were scrapped in the 30s, but most survived the war. Some 21 made it onto the BR books and the last were scrapped in 1950. 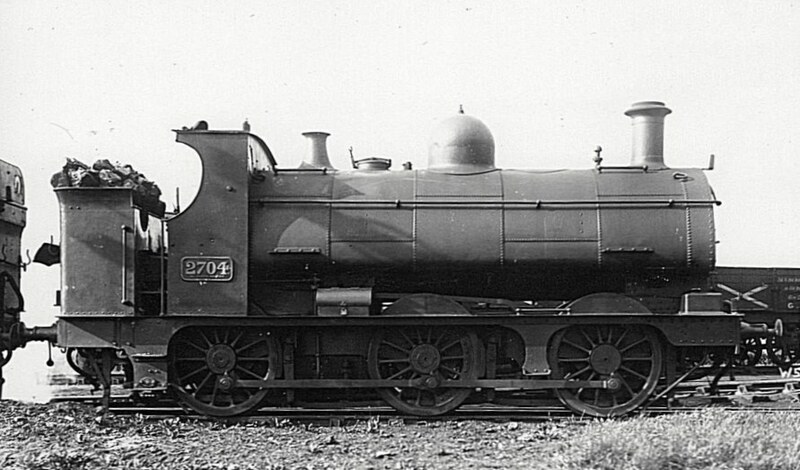 2704, of the 655 class, in near original (1895) condition, with a five (and a bit!) segment tank. Picture date unknown. 655 class 1742 at Tyseley on 13 October 1935, with a Churchward bunker. The loco was shedded there for many years. When pannier tanks were fitted to these early types of inside-framed large locos with large tanks, both Swindon and Wolverhampton introduced the small handrail on the tank to assist climbing up to the filler. The first inside framed Swindon class was the 1813 class of 1882. 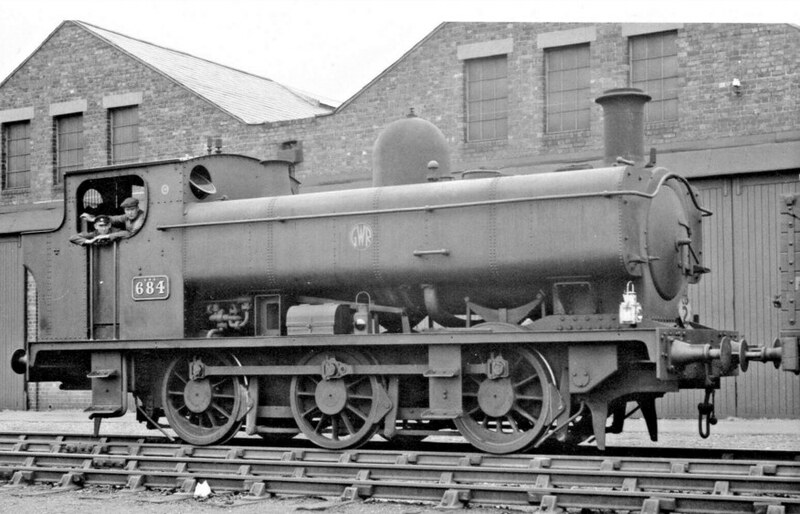 Like the 633 these were built as side tank engines, but with open cabs. These had a 6'0" rear overhang and thus intermediate sized bunker. The boiler was effectively a slightly thinner P Class. 40 were built. They were followed by the 1854 (or 1701) series of 1890–95, numbering 120. 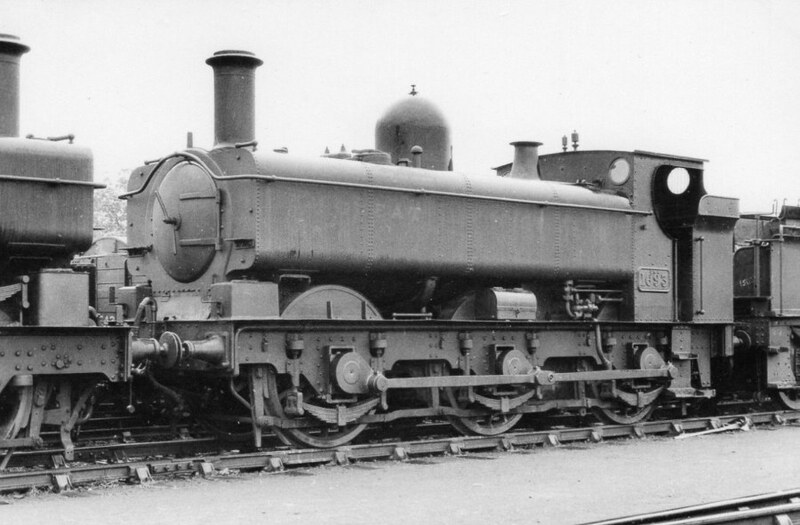 These had P class boilers, 7'3" + 8'3" wheelbase with 4'6" wheels, again later converted to 4'7½" and with a larger rear overhang of 6'6", adopted by all subsequent classes. 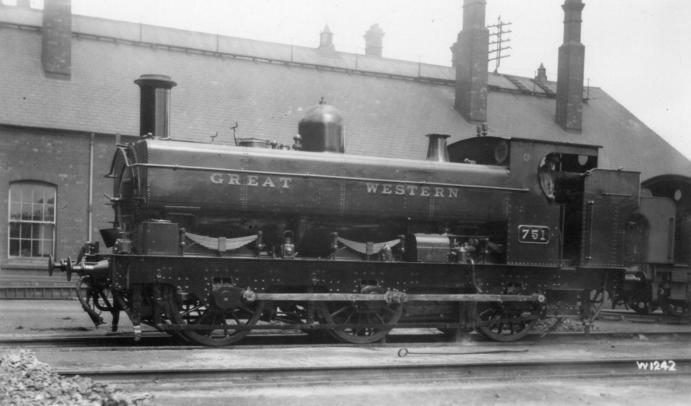 The last 19th century builds at Swindon were the 2721 class, 58 built from 1897–1900, and another 22, the 2779 subclass, built with slightly larger cylinders in 1900/1. These all had the same wheelbase as the 1854s and were built with the thicker tyred 4'7½" wheels. The main differences from the 1854s were suspension arrangements and fluted coupling rods. Most 1813 locos received saddle tanks and true P class boilers from 1894, but one retained side tanks as late as 1907. 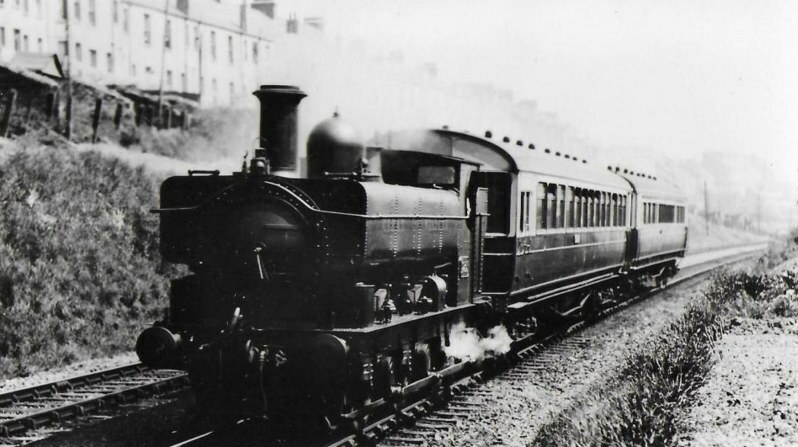 This class was also amongst the earliest to receive pannier tanks, one as early as 1903. Thus all three styles could be seen together on the same class of 40 engines. The new tanks didn't start to be widespread until 1910/11. Most got enlarged bunkers in the 20s, about half with enclosed cabs. The tended to be withdrawn in the 1930s, with just one surviving to BR ownership. For the 1854/1701 class, Belpaire boilers appeared from 1901, and pannier tanks from 1911. Withdrawals started in the 30s and 40s. 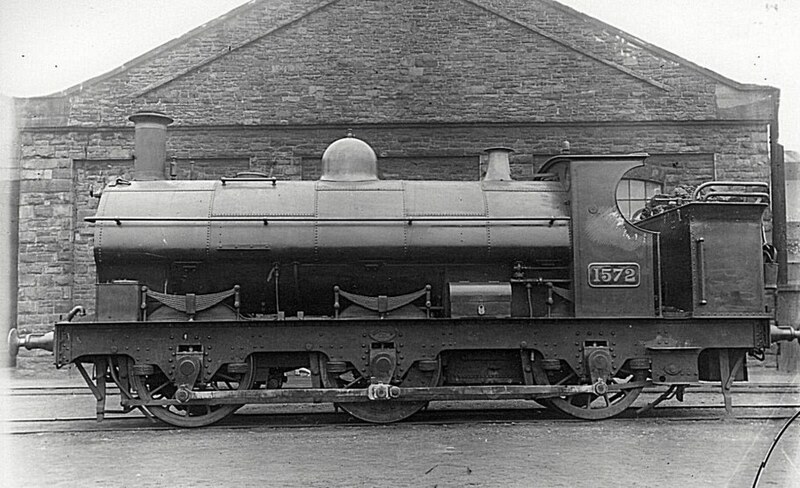 1729 was scrapped in 1943 after having been virtually torn apart in an air raid 9. 23 made it to BR ownership, but the last were scrapped in 1951. 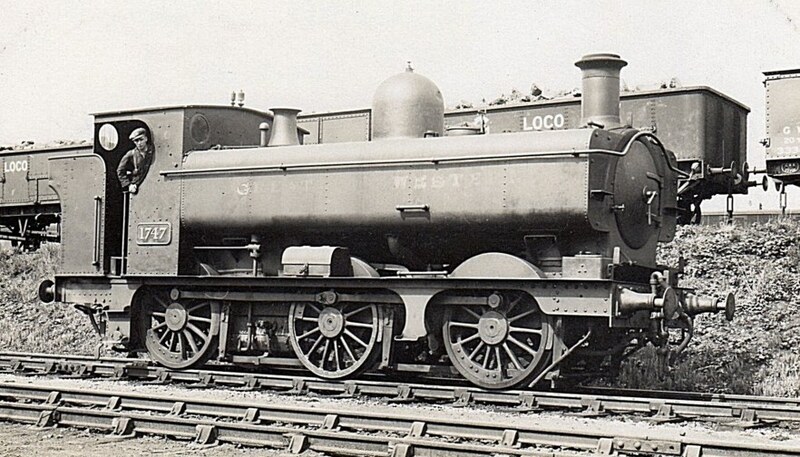 As with the 645/1501 & 655 classes, the 1813, 1854/1701 and 2721/2779 locos were fitted with small handrails on their pannier tanks to assist accessing the filler, but the longitudinal position of the handrail was not standardised. 41 of the 2721 class received enclosed cabs, one whilst still fitted with a saddle tank, and most received enlarged bunkers. All had pannier tanks by the 1920s. All survived the war, about half were transferred to BR, but all were withdrawn between 1948 and 1950. The 2721 class with enclosed cab and extended bunker. The direct relationship with the 5700 is clear. 1815 at an unknown location. 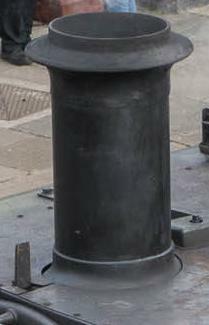 Members of the 1813 class were the first engines to receive pannier tanks, and appear to have retained copper caps to their chimneys. 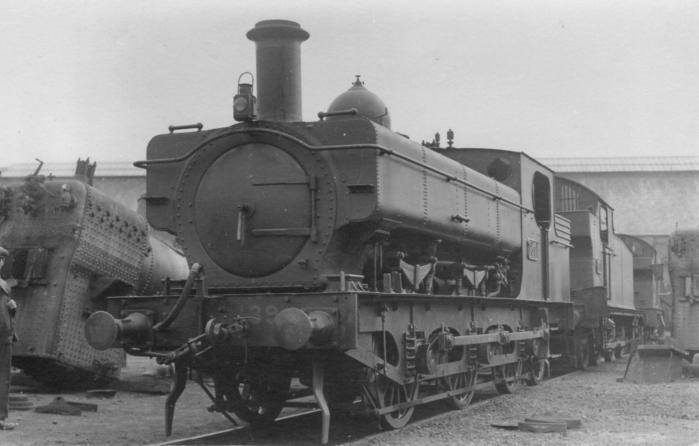 907, of the 1854/1701 class, with an enclosed cab. 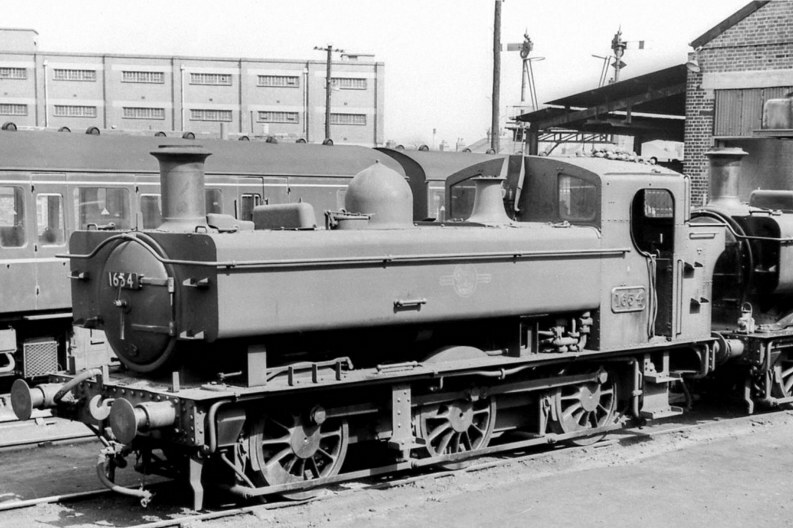 Apart from the valance and chimney style, and the sandbox location, there is little cosmetic difference between the later appearance of this class and the Collett 57xx. By the time Collett took over the older outside-framed engines were getting on for fifty years old, and replacements were required. 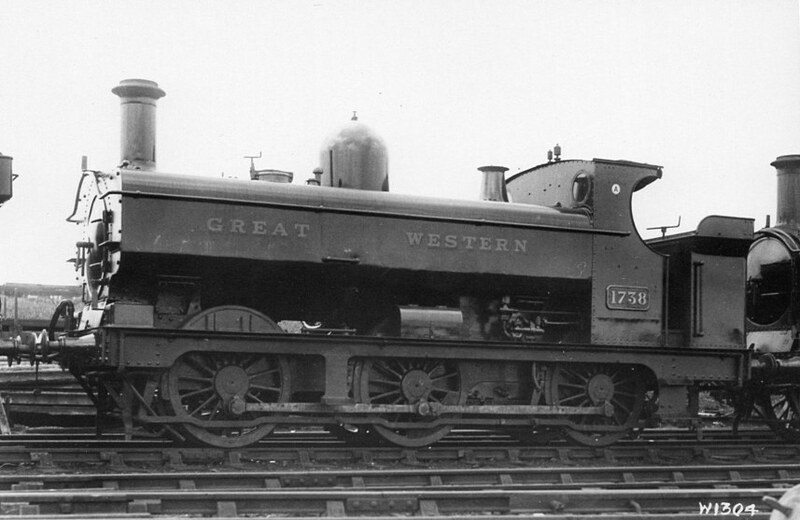 In Collett style he took the earlier locomotives as a model, and the 57xx could be regarded as being essentially a 1930s condition 1854 with the larger cylinders of the 2779 series of the 2721 class. 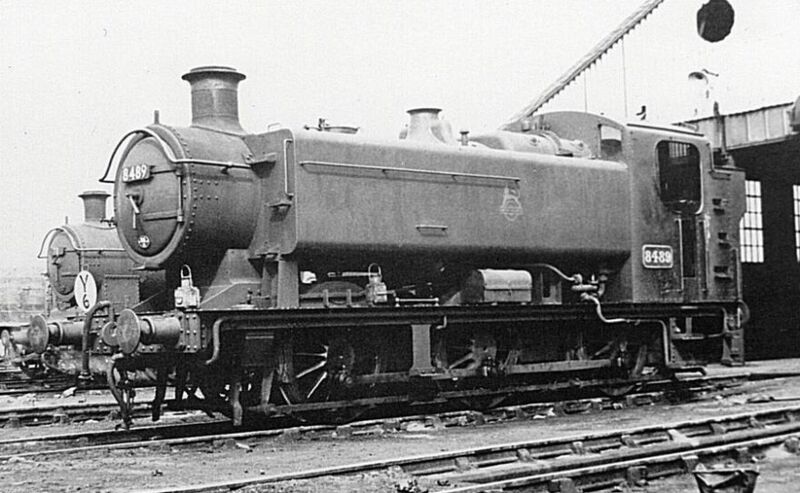 They had the same 6'9" rear overhang as the last Swindon saddle tanks, but a slightly increase front overhang of 5'6". They had many detail improvements in design and construction, and could run much greater distances between overhauls than their predecessors 10. 250 were built in 1929/31, many by outside companies with loan act government finance. 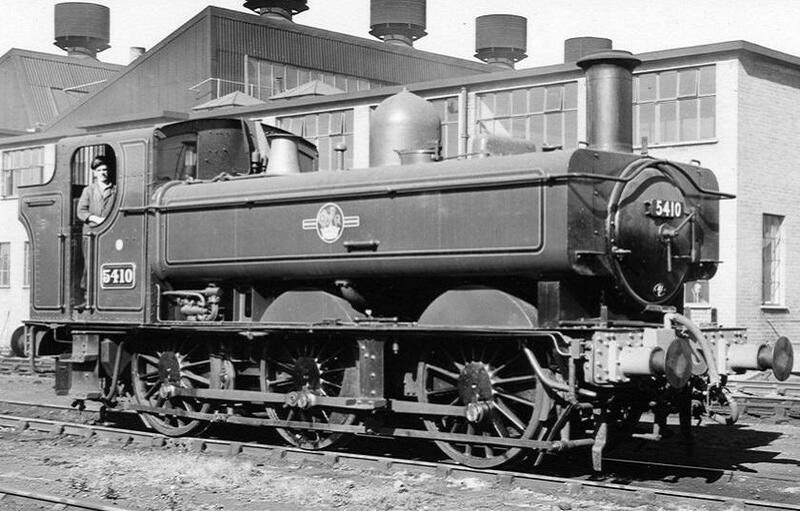 A subclass of 50 from 6700 (numbers 6700–49) was also built in 1930/31, but without vacuum brakes or ATC or steam heating, so could only be used for shunting. They were fitted with 3-link couplings. Of the locos built by outside contractors, 6700–49, 7700–24 and 8725–49 were built with riveted tanks. Except for 6700–49, which had steam brakes, the 5700 class locos had vacuum brakes and steam heating. ATC was fitted to earlier members of the class within a few years. In 1933 the 8750 subclass was introduced which had a more thoroughly enclosed cab than the earlier lots. About 420 of these were built up until 1950. All were fitted with ATC, steam heating and vacuum brakes from new, except 6750–79 (built from 1947 to 1950), which were 'shunting locos' fitted with steam brakes and three link couplings only, and thus were effectively an 8750 version of the 6700 subclass. The 9700 subclass of 11 was built in 1933. 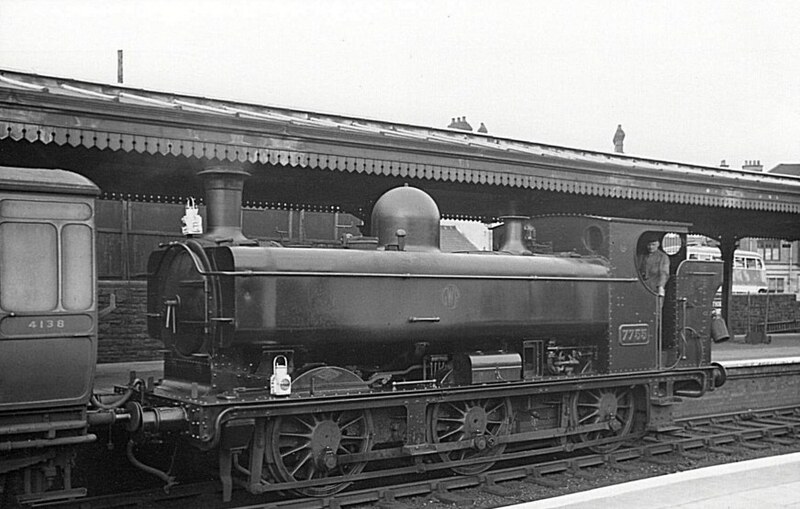 These were fitted with condensing gear and had distinctive short hybrid pannier/side tanks, an 8750 style cab and a water feed pump on the right hand side of the smokebox. They were fitted with tripcock gear for working over the Metropolitan lines and had a special type of ATC shoe that could be lifted clear of the centre conductor rail. They replaced the "Get Wets": 633 and Metro class tanks with condensing equipment and still without any kind of cab in 1933! There was little development of the class other than a new form of topfeed introduced in 1942, to both the 5700 and 8750 classes, although it did not become standard for new construction until 1944. Backfeed boilers remained in existence for a long time however, and locos could swap from one form to another in boiler interchanges at works visits. There were one or two temporary 8750 class conversions to oil fuel. Whistle shields began to be added from 1936, as did steps on the fireman's side, with an extra handrail high up on the fireman's side. 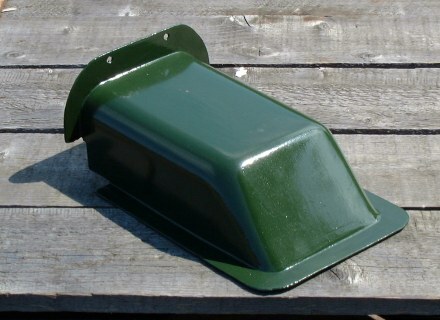 A larger whistle shield was adopted for the 8750 class locos from 1938. Cab doors began to be fitted to the earlier locos. Posing behind a couple of tank-lifting rings, this is the casing fitted over the topfeed on the topfeed boilers fitted from 1944. In side view, the casing has slightly tapered sides (unlike the casing on the Dukedogs and the 48xx 0-4-2T, which had parallel sides). Image courtesy Kevin Dare. Cover for the lubricator pipes between the tank top and the cabfront. The pipes exit the cab front and go under the boiler cladding. Image courtesy Kevin Dare. Apart from the main difference in cab styles between the 5700 and 8750 classes, the other detail differences were in cab handrails, brake hangers, tankfront steps and injector routing. The brake hangers on the 5700 class were 'twin strips', whereas the 8750 had a more substantial cast version. Many of the 5700 class were fitted with the 8750 class style of brakes later in their lives. Many 5700 locomotives also had their original style cab handrails altered to the style on the 8750 class. 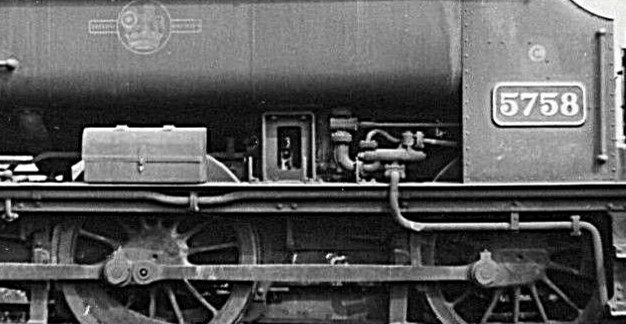 The style of the footsteps on the front of the tanks changed from a simple flanged one on the 57xx class to a welded one with turned up sides on the 8750. There were also variations in the way the injector overflow pipe passed through or outside the footplate. In 1950, 57xx and 8750 class locos were reclassified from 'blue' to 'yellow' route restriction, in consideration of their low hammer-blow. 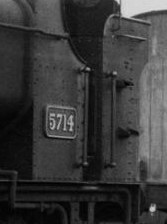 Detail of the tank top on preserved 5764. The rectangular shape adjacent to the chimney is the 'lubricator and blower pipe cover', which allows the pipes from the cab to come from under the boiler lagging, around and into the smokebox. Under British Railways ownership the 57xx spread around the system: for instance a pair worked as banking engines in Folkestone harbour 11. All were withdrawn between 1957 and 1964, with some being sold on to London Transport and the National Coal Board. 13 have survived into preservation. For information on the building dates and the builders of the 57xx/8750 classes, see John Daniel's listing. The front end of newly-outshopped condenser 9701. Its tripcock gear is behind the step, and is clipped up into the raised position. The tanks on these condensers were 1230g capacity. The finale to the large pannier tanks was Hawksworth's 9400 class. According to one source 12, the GWR General Manager Sir James Milne felt that the large domes on the 5700/8750 looked rather old-fashioned. 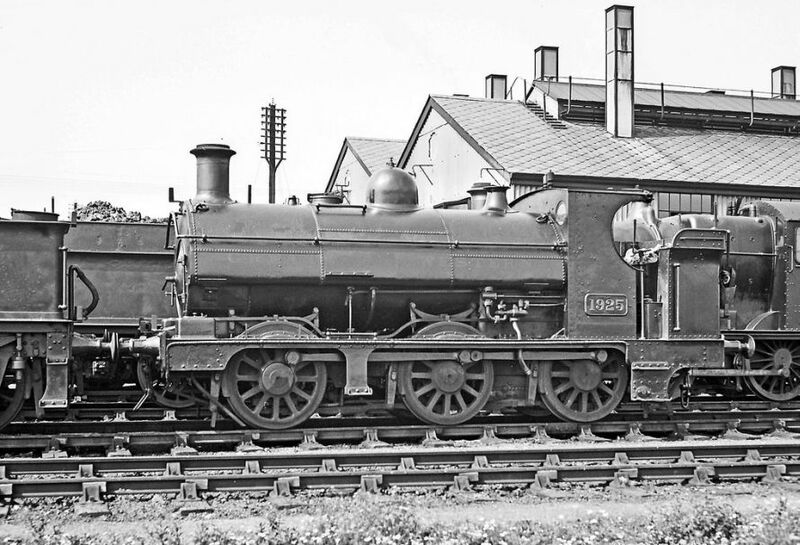 Although substantially similar to the Collett engines below the footplate, these were significantly bigger and heavier engines than their predecessors – 2' longer overall. 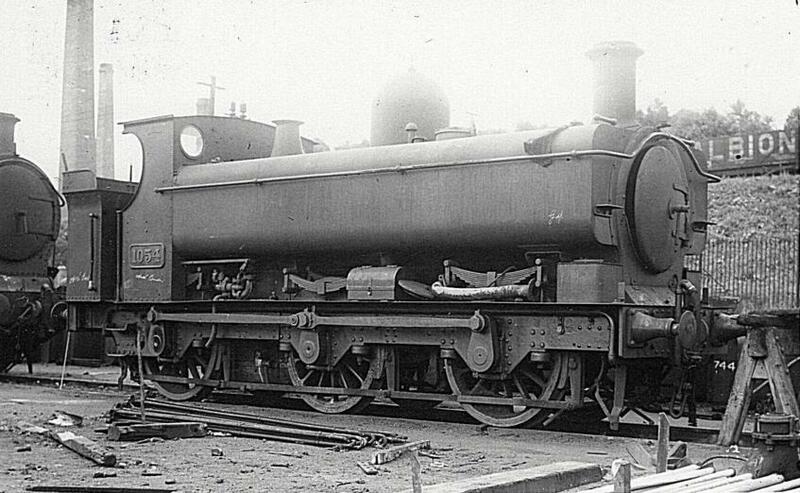 They had a Standard 10 boiler, much larger and tapered and domeless, an especially wide cab, and tanks that stopped short at the smokebox. However, the wheelbase and wheel size remained at 7'3" + 8'3" wheelbase and 4'7½" wheels – unchanged from seventy years earlier! These were the heaviest of the pannier tanks and restricted to red routes. The first ten were built at Swindon and came out in GWR colours, but the remaining 200 were built between 1950 and 1956 under British Railways, all by outside contractors. There has been much criticism of the decision to build the 9400, especially so many of them, even from GWR Sources 13. However, RCTS 14 states that they were originally designed not to supplement 57xx but to replace withdrawn absorbed locomotives from the Welsh companies. There were around 200 absorbed 0-6-0T and 0-6-2T tanks surviving at the end of the war, all of which were due to be withdrawn over the period that the 9400 class deliveries were scheduled. The larger capacity boiler and increased adhesive (= braking) weight gave the 9400s capabilities that the 5700 class lacked. In the event everything changed, and many had a very short lifespan. Off the GWR system some were used in twos and threes and even fours as bankers on the Lickey Incline. Two have survived into preservation. In the Victorian era these were exclusively built at Wolverhampton. The 850 class had a 7'4" + 6'4" wheelbase, 4'7" front and 6'3" rear overhangs and smaller 4' wheels. When thicker tyres were used they increased in diameter to 4'1½". 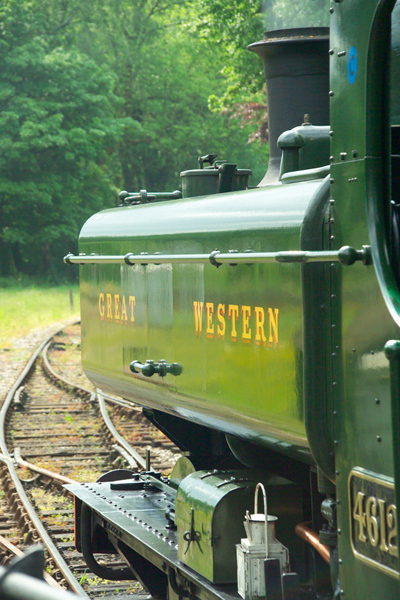 36 were built between 1874 and 1877 as saddle tanks with no cab, just a spectacle plate and side sheets. The 120 of the 1901 class, built 1881 to 1897, were essentially very similar, but had open cabs and the larger tyres from the start, and larger tanks on those built from 1888. Once they had all received saddle tanks and cabs the two classes were effectively merged. One-third of the 850 class locos ran with H-spoke wheels. 1931 in early five-segment saddle tank mode, with a cab and Wolverhampton bunker and rear spectacle plate. The filler is behind the dome, and there are two steps and two upper handrails on each side. The worksplate is on the bunker side. Some 850s and 1901s received lengthened frames and rear overhangs, and thus larger bunkers. Belpaire fireboxes started to be introduced in 1910, but the round firebox boilers were long lived and a few never received the Belpaire boxes. Most were converted to pannier tanks from 1910 through to the 1920s. Quite a number had pannier tanks fitted on boilers with round top fireboxes. A reasonable number retained (or in a couple of cases reacquired) saddle tanks until scrapping, and two retained saddle tanks into BR days. Around half gained enclosed cabs. Scrapping started in the early 1930s, but 43 survived into BR days and a good few were still active into the 1950s. The boilers were always class R, although they differed in detail over the years. 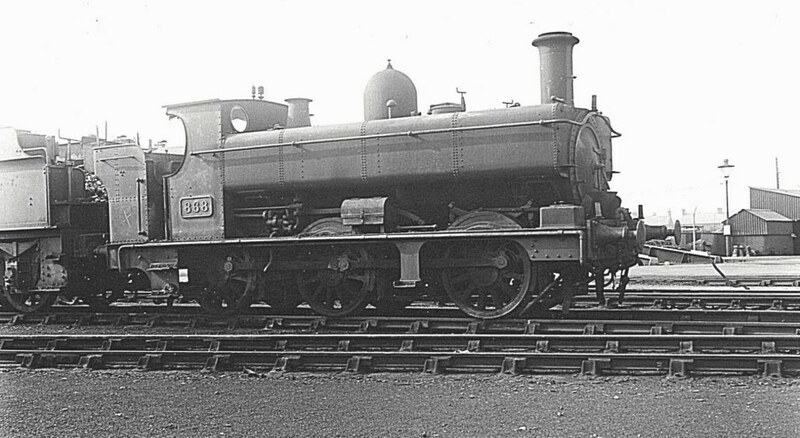 1925 at Didcot, 16 August 1936. 1925 and 2007 took turns working the Lambourn branch in the late 1930s, and retained their saddle tanks into BR days. 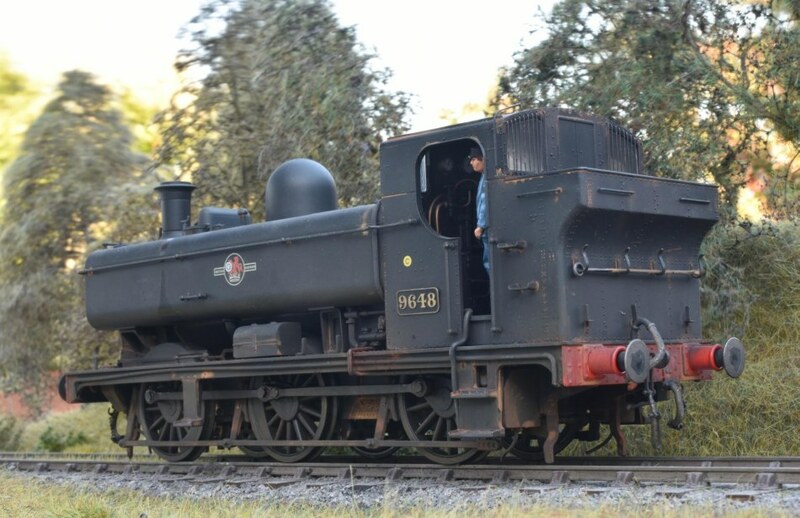 868, still with early dished smokebox door and snaphead-riveted tanks has a Churchward bunker in the upper picture, and a few years later, below, has acquired a Collett bunker. Both pictures are at Swindon. A grubby open-cabbed 1949 at Oxford, probably just after WWII, with a Wolverhampton bunker. Note the difference betweeb the spacing of the insignia compared to 1935 below. 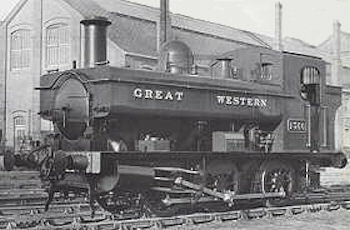 From 1897 Wolverhampton built the 2021 class, an enlargement of the 850 which had a boiler with a larger firebox, known as the Class U. These still had the 4'1½" wheels, but with 7'4" + 7'4" wheelbase and 5' front and 6' rear overhangs. From 1902 the last batches were built with a Belpaire firebox and a domeless boiler, but still with saddle tanks. These were the 2101 class. The class totaled 140 locos. These too sometimes received extended frames and bunkers, taking the rear overhang to 6'9". 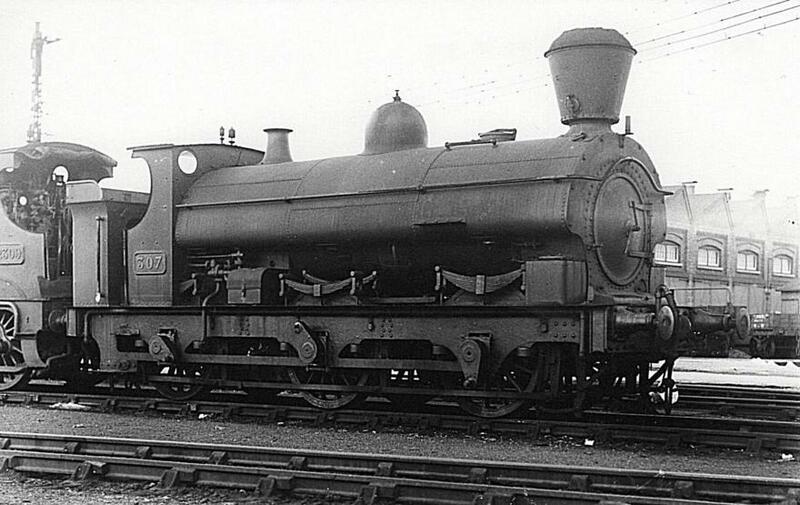 When pannier tanks came along the 2101 series retained the domeless boilers for a while, but eventually all reverted to domed boilers. A few boilers featured a small topfeed (without a cover casing). 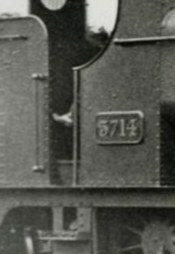 Many of the 2021 class were autofitted, and two were even temporarily fitted with a dummy coach shell so that they looked more harmonious in the middle of their trailer cars. Two more were used by Collett for experimental rebuilds to develop the 5400 and 6400 classes. Some swapped back to saddle tanks with boiler changes, and around 60 had enclosed cabs, some on occasion reverting back to the open ones. 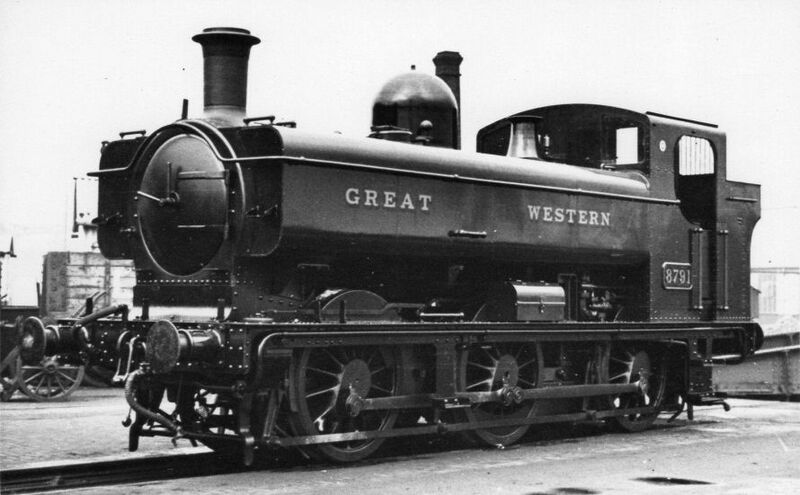 A very few were withdrawn before the war, but most survived until the 1940s and 1950s, some as late as 1958 to be the last surviving GWR pre-grouping 0-6-0 tanks 15. 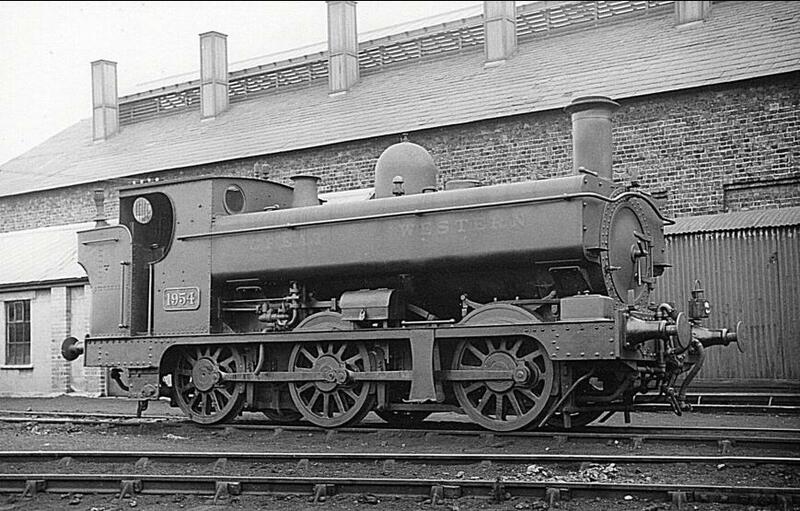 2116, fitted with a rear weatherboard (probably by Wolverhampton). Date and location unknown. A strange mixture of a pre-WWI tall chimney and a post-1924 Collett bunker on a domeless 2118 in saddle tank mode. Many domeless 2021 and 2101 saddle tanks had very short chimneys, e.g. 2028, 2048, 2121, 2144. A batch of new engines, the 25 members of the 5400 class, followed from 1931/2 with the last batch in 1935. These had the 5'2" wheels, still the 7'4" + 7'4" wheelbase and a fully enclosed cab. Overhangs were 5'2" and 7'7". 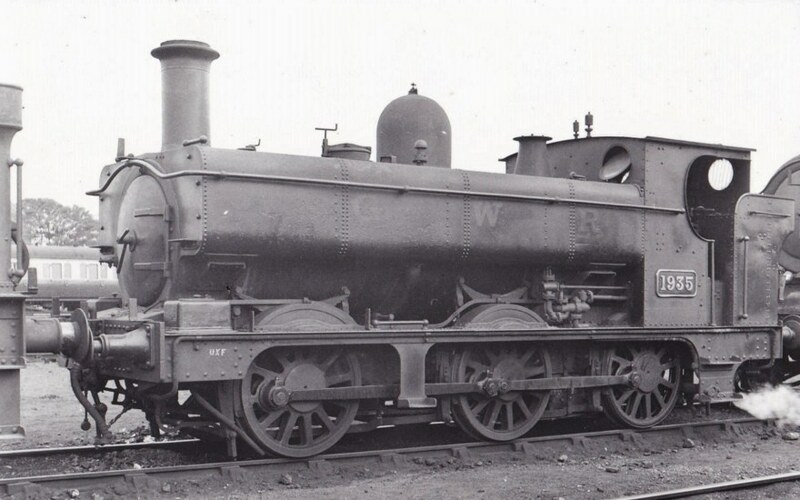 They had a Standard 21 boiler (basically a Standard 11 but with drumhead smokebox). Topfeeds were fitted to the boilers from WWII onward. The 54s were mostly withdrawn in the late 1950s, with one surviving to 1963. Although three made it to Barry scrapyard, all were cut up by 1965 so none were preserved. For hillier territory the 5'2" wheels were too large, so another 2021 was rebuilt, this time with the 4'7½" wheels of the larger tanks. This was the prototype for the autofitted 6400 class, with 40 built from 1932 to 1937. For further notes on the detail variations in the 64xx class, see here. At approx 45½ tons, these locos were slightly lighter than the 5700/8750 locos, and had a greater route availability. 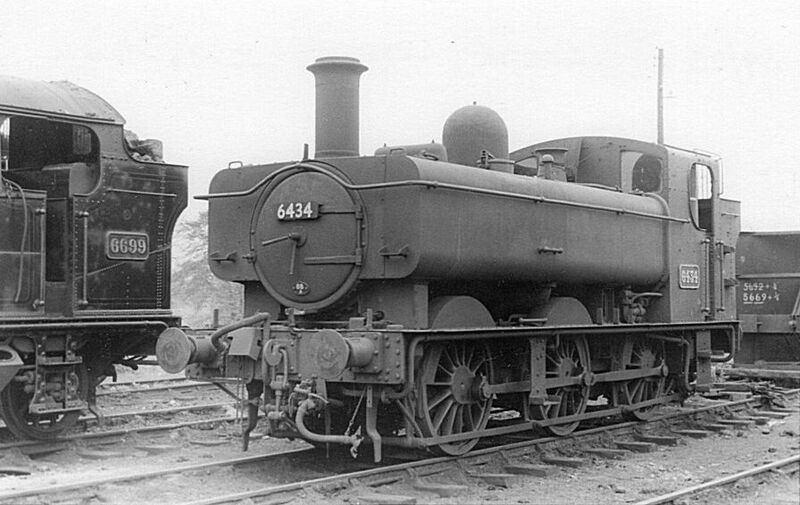 These were followed by the very similar but non-autofitted 7400 class, with a higher pressure boiler. 30 were built in 1936/37, ten more in 1948 and another 10 as late as 1950. Topfeeds were introduced to the boilers in later years, but the pool of non-topfeed boilers remained viable for many years, and locos could be seen with them even in late BR days. 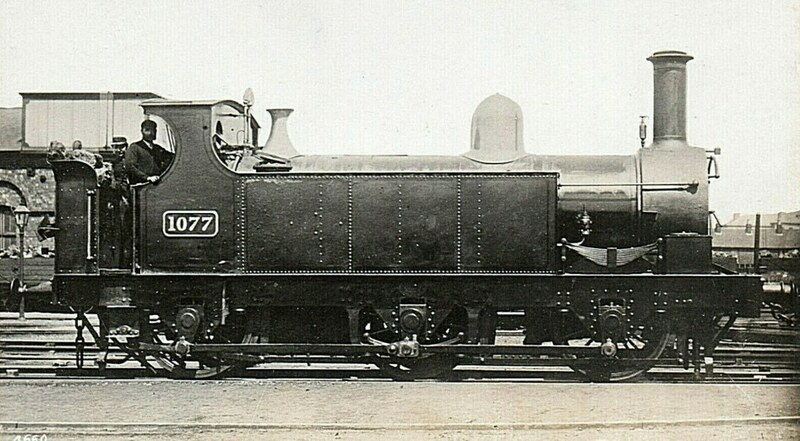 These "small" engines were in fact as big and powerful as the early double framed "large" classes such as the 1076, which were now disappearing. The 64s lasted a little longer. Happily three were preserved, initially by the Dart Valley Railway, although they have since found other homes. The 74s nearly all lasted until the 60s, but none survived. 6434 at Radyr on 16 October 1960. Like many other autofitted engines, a packing piece is fitted behind the buffer headstocks. On flat-top panniers, the chimney base was set into a circular aperture in the top plate. 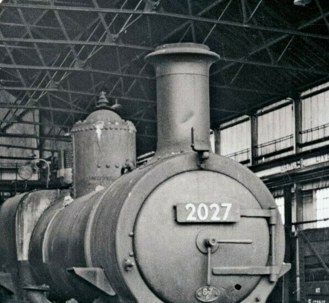 The 2027 picture adjacent, with its tanks removed in 1957, shows the chimney is seated conventionally on the smokebox. Hawksworth again provided a finale, turning out the small lightweight 1600 class to replace the now very elderly 850s and 2021s, returning to the 4'1½" wheels, and keeping the 7'4" + 7'4" wheelbase. They were shorter than the 54/64/74 series, with 5'2" front overhang and 6'9" rear 16. The footplate was raised to a more conventional height compared to the earlier 850/2021 engines. The 1600s were built entirely under British Rail, but were in every sense a Great Western engine. Unlike the 9400s, the 1600 retained a domed boiler. Like the 9400s they also scattered round the system, two even ending up in Scotland 17. As well as being lightweight, the 1600s were low in height for use on lines with a restricted loading gauge. 80 were built, the first 50 in 1949/51, and the last 30 in 1954/5. They had a very short life, some being only 5 years old at withdrawal, which was between 1950 and 1965. One has survived into preservation. Beyond these major groups there were quite a number of small pannier tank classes and conversions. 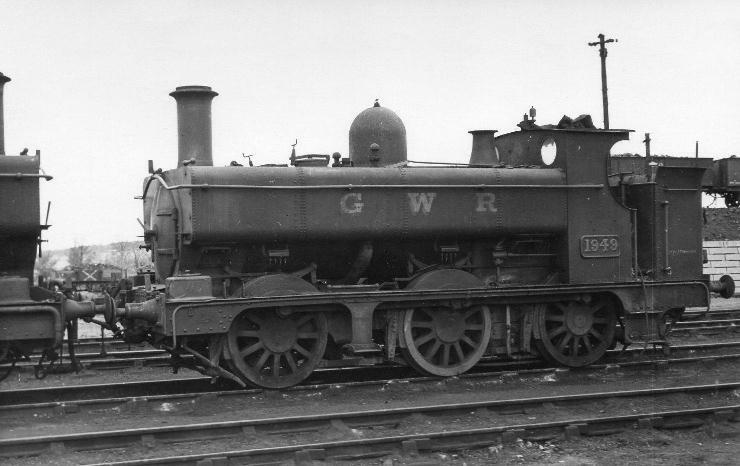 Quite a few absorbed 0-6-0 classes received similar rebuilds to the native engines, and little Manning-Wardle 0-6-0s with GWR cabs, fittings and pannier tanks were in the writer's opinion a particularly cute combination. There was even an 0-4-0 pannier tank, no 795, only 21' over buffers, which was one of the engines taken over from Powlesland and Mason 18. The other pannier tank classes built by the GWR in the 20th century were the very small and light 1366 class and the very substantial 15xx. 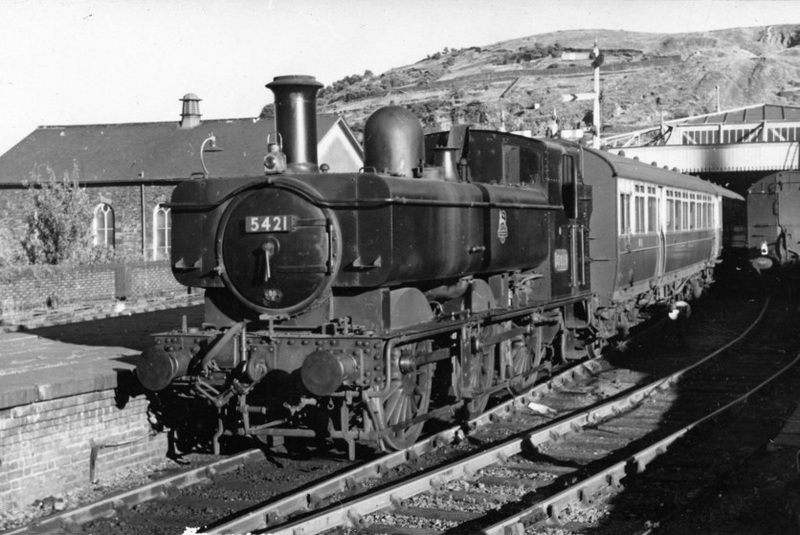 The 1366 was an updated version of the 1361 saddle tank class, itself an update of an engine used on the Cornwall Minerals Railway 19 whilst the 15xx was a 9400 boiler and tanks on a very short wheelbase chassis with outside Walschaerts valve gear, and somewhat unsteady at speed 20.One of each has survived into preservation. 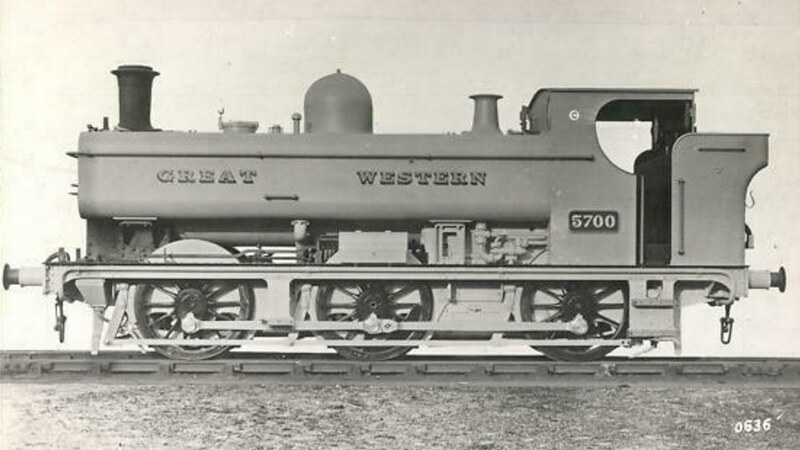 The GWR inherited a bewildering variety of inside- and outside-frame 0-6-0 tank engines from the constituent companies at the Grouping in 1922. Most of these locos were given belpaire fireboxes, pannier tanks and Swindon boiler fittings. Such locos surviving WWII were generally swept away with the arrival of the large 94xx tanks. 684, an ex-Cardiff Railway tank, at Cardiff East Dock on 18 September 1937. It was originally built as a saddle tank in 1920 by Hudswell Clarke, and survived until 1954. 4 The Locomotives of the Great Western Railway Part Five: Six-coupled Tank Engines, N J Allcock, F K Davies, H M Le Fleming, P J T Reed & F J Tabor, The Railway Correspondence and Travel Society is the best source for this sort of detail. 6 The Locomotives of the Great Western Railway Part One: Introductory Survey, N J Allcock, F K Davies, H M Le Fleming, P J T Reed & F J Tabor, The Railway Correspondence and Travel Society. 7 The Class letters for boiler classes which became extinct were later re-used for other types. 9 Photo: All in a Day's work: Life on the GWR, Tim Bryan, Ian Allan, 2004, p123. 16 Collett & Hawksworth locomotives, a Pictorial History, B Haresnape, Ian Allan, 1978 as reported on GWR-elist. 18 A Pictorial Record of Great Western Absorbed Engines, J H Russell, OPC, 1978, p255. Drawings are approximately redrawn from Russell but are strictly representative and may contain errors.